Why the rush in selling the Floating Rate Notes? Over the past 12 months €2.5 billion of bonds issued as part of the IBRC liquidation in February 2013 have been purchased by the National Treasury Management Agency from the Central Bank of Ireland. The IBRC was the entity formed when the carcasses of Anglo Irish Bank and Irish Nationwide Building Society were merged in 2011. A year earlier a massive creditor bailout was engineered using €31 billion of Promissory Notes. Under the structure the money to repay the creditors of these failed institutions (mainly deposits) was borrowed from the Central Bank of Ireland under the guise of Emergency Liquidity Assistance (ELA). Under the terms of the Promissory Notes this ELA was to repaid in tranches with payments of €3.1 billion to be made in March of each year beginning in 2011. There was a lot of confusion about this structure but as shown by Prof. Karl Whelan it would have taken payments of €3.1 billion each year up to 2022 to repay the ELA used to bail out the creditors of Anglo and INBS availed of using the Promissory Notes. The rate on new government borrowing as this became the financing cost as each annual payment of €3.1 billion was made. There were many issues with the Promissory Note structure but chief among them was the pace at which relatively cheap funding through the Central Bank was to be converted to more expensive funding through the NTMA. That is, each €3.1 billion payment meant that less debt was being financed at the lower ECB refinancing rate and more debt was being financed at the higher government borrowing rate. The €3.1 billion payment was made in 2011 and was fudged in 2012. In February 2013 the Promissory Note structure was cancelled and in its stead the Central Bank was given €25 billion of long-dated, floating-rate Irish government bonds and could use the proceeds from these to settle the remaining liabilities outstanding created when the ELA that was issued in 2010. The new structure was an improvement on what preceded it. The main reason for these was that the pace at which debt was moved from the ECB refinancing rate to the government borrowing rate was slowed down. Under the Promissory Note structure the debt spent an average of c.7 years being financed at the ECB rate. Under the initial terms of the Long-Term Bond arrangement this was increased to c.15 years. And as the ECB rate has since reduced to 0.05% the external cost to the State of the debt created under the original Promissory Notes is relatively miniscule (0.05% of €25 billion is €12.5 million). The Central Bank of Ireland will sell the bonds but only where such a sale is not disruptive to financial stability. They have however undertaken that a minimum of bonds will be sold in accordance with the following schedule: to end 2014 (€0.5bn), 2015-2018 (€0.5bn p.a. ), 2019-2023 (€1bn p.a. ), 2024 and after (€2bn p.a.). These terms were used to estimate the interest savings that the new structure would generate. Instead of having the debt financed at the ECB rate paid off by 2022 (and replaced by higher costing debt funded by borrowing undertaken by the NTMA) this was not supposed to happen until 2032 when the last of the long-term bonds was to be sold by the Central Bank. Under the original terms, a minimum of €1 billion of the bonds were to be sold by the end of 2015. The only update we get from the Central Bank on the bonds is in its annual report published each May. However, as the press release linked above show the NTMA has bought €2.5 billion of the bonds in the past 12 months and subsequently cancelled them, with €2 billion in 2015 alone. The Central Bank may have sold more of them this year but that is probably unlikely. From the Central Bank’s 2014 annual report we do know that the only sale in 2014 was the €0.5 billion bought by the NTMA. This is extracted from Note 15 to the report. During 2014, the Bank sold €500 million nominal of the FRNs (2038 FRN) realising gains amounting to €180.3 million. The price paid for the bonds was around €680 million, with €500 million going to reduce the Central Bank’s liabilities to the Eurosystem (the process that saw the money “created” in 2010 is reversed with the money now “burned”) while most of the €180 million will be returned to The Exchequer as part of the Central Bank Surplus. We know that the NTMA bought a further €2 billion of these bonds in 2015 but we don’t yet know the price paid. From the table above we can see that, at the end 2014, the Central Bank valued the €24.5 billion of the bonds it held at €33.6 billion. Given that the yields on Irish government bonds were relatively stable in 2015 it would seem that the price paid by the NTMA for the €2 billion of the bonds it bought this year was probably around €2.7 billion. Thus, there will have been a further €2 billion reduction in the Eurosystem liabilities of the Central Bank while most of the other €700 million will return to the Exchequer. But the key question is: if only €1 billion of these bonds had to be sold by Central Bank by the of this year why have €2.5 billion of them being sold – and why has the NTMA bought them? In 2013 the Bank acquired €3.5 billion nominal of the 5.4% Irish 2025 Government Bond following the IBRC liquidation. During 2014, the Bank sold €2,300 million (2013: €350 million) nominal of the bond realising gains amounting to €537.6 million (2013: €24.8 million). As at 31 December 2014, the 5.4% Irish 2025 Government Bond was valued at €1.2 billion giving rise to an unrealised gain of €290.5 million (2013: €292.7 million) as at that date. The Central Bank received around €2.8 billion for selling €2.3 billion of the bond. But why didn’t the NTMA buy this bond as it has done with the others. The reason is that this is a fixed coupon bond. Although the annual coupon rate is 5.4 per cent the yield for the purchaser was much lower (probably around 1 per cent) as the purchase price was significantly greater than the face value. There was little to be gained by the NTMA buying this bond. Most of the 5.4 per cent coupon will be covered from the gain realised by the Central Bank by selling to a third party. So why is the NTMA willing to buy the other bonds? Because they are Floating Rate Notes. Unlike the 2025 bond above there is an element of interest rate risk associated with these bonds. The Central Bank could sell these bonds to a third party but the NTMA risks paying higher interest to this third party in the future if interest rates rise. The FRNs pay interest at a rate equal to the 6-month euribor rate plus a fixed spread which differs between the bonds of different maturities but has a weighted average of 2.62%. It can be seen how exceptionally low the current rates are. But if the rate was to rise to say 3 per cent then the interest cost on the floating rate notes would rise to an average of 5.6 per cent and would rise even more with further increases in the 6-month euribor. However, all this tells us is that if the Central Bank is to sell the bonds then it is probably in our interest for the NTMA to purchase them (unless you think the 6-month euribor will stay below 1 per cent for the next decade). It doesn’t answer the key question as to why the bonds are being sold ahead of the agreed schedule. Following discussions with the Central Bank of Ireland, €500 million nominal of the 2038 bond was bought back and cancelled by the NTMA in December 2014. It could be that the accelerated sales are at the behest of the NTMA rather than the Central Bank (which faces pressure from the ECB to sell the bonds – monetary financing and all that). Of course, we don’t really know but we do know that the current low borrowing costs for the government can be used to justify the sales. Back in September the NTMA issued 15-year debt at a yield of 1.8%. If the ECB rate was to rise above 1.8% then the NTMA buying the bonds could lead to savings as the 1.8% financing cost locked in now would be below the financing cost if the Central Bank still held the bonds in circumstances where the ECB rate was higher. What implications do such sales have for the overall position of State’s finances? One way of thinking about the Exchequer’s position in this regard is to consider the disposal by the Central Bank of FRNs to the NTMA. For example, in December 2014, the NTMA bought €500m (nominal) of the 2038 FRN from the Central Bank for a cash price of €680m. The €680m was, of course, funded by the NTMA in the market, at the current low interest rates, but the additional €180m has augmented the 2014 profit of the Central Bank, the bulk of which will be distributed back to the Exchequer as surplus income. So the Exchequer is now servicing the €500m at current market yields with the bulk of the €180m being returned to it in cash. Thus, from the point of view of the Government's budget, the disposal can be seen as a refinancing of part of Government debt at current market rates, which are much lower than the rates which prevailed when the FRNs were issued. As long as the Central Bank is the holder of the FRNs, and as long as the effective cost of funds to the Central Bank (in practice, the ECB Main Refinancing Rate or ‘MRO’ rate, currently 0.05 per cent.) is below the coupon on the bonds, there will be some net interest contribution to the Central Bank’s profits. Since most of the Central Bank’s profits are remitted as surplus income to the Exchequer, it might appear that a relatively slow pace of disposal would benefit the Exchequer. The eventual impact will, of course, depend on a range of factors, including future interest rates, which cannot be predicted with accuracy. Nevertheless, when interest rates on new issues of Government debt were much higher than they are today, refinancing would have seemed relatively expensive and this would have supported the idea that slower sales might be beneficial to the Exchequer. However, the current low cost of refinancing by the NTMA, though still somewhat above the Central Bank's effective cost of funds, reflects the exceptionally low level of interest rates and it could, therefore, be below the cost of the same refinancing at some point in the future. As a result, any small short term gain to the Exchequer resulting from slower refinancing could be more than offset by a higher cost of refinancing in the future. The same point was made here. But the reality is we simply can’t tell with any certainty what, if any, the benefits would be. The best situation would be if the debt didn’t exist at all. Next best would be for the Central Bank to hold the bonds until maturity ensuring that the net cost remains at the ECB refinancing rate which will always be below the government’s borrowing cost. If there are benefits from doing this now why move €1.5 billion ahead of the minimum sale schedule for the end of 2015? Why not more? Will the accelerated pace of sales continue in 2016? Why are the shortest dated of the bonds (the 2038s) being cancelled first rather than the longest dated (the 2053s) or a combination of bonds? If there are accelerated sales now does that mean there can be a sales “holiday” in the future if there is a period of high interest rates and/or an abnormally high spread between the 6-month euribor and the ECB’s main refinancing rate? If the Promissory Notes still existed would we be making accelerated payments on them?!? In 2014 Ireland imported €4.8 billion euro of services from Bermuda with the Netherlands importing €13.9 billion of services from Bermuda in the same period. In 2014 Ireland and the Netherlands accounted for 86 per cent of the EU’s service imports from Bermuda. Luxembourg had imports of €1.6 billion and the UK figure was €0.4 billion. Total service imports from Bermuda for the remaining 24 countries of the EU was €1.0 billion. This is a total of €21 billion of inflows to Bermuda from EU countries under the guise of services. Bermuda is a small island in the North Atlantic. It is a British Overseas Territory and has a population of around 70,000. It has a GDP of around US$5 billion which gives a pretty impressive per capita figure of around US$80,000. But a quick question emerges. If Bermuda is receiving nearly €18 billion in exports to just two countries (Ireland and the Netherlands) why isn’t this showing up in value-added in the Bermudan GDP figures? Bermudan GDP is high but it should be off the charts. Are there offsetting imports to Bermuda? Here is a table from Bermuda’s Department of Statistics giving the payments and receipts of the Current Account. In the receipts panel we can see that total service receipts are BD$1,377 million. The Bermudan dollar is on a one-for-one peg with the US dollar. So at one end we have €18 billion of payments flowing out of Ireland and the Netherlands with the data at that end showing this as flowing to Bermuda. At the other end we have no sign of this being reported as an inflow in Bermuda. It seems there is a Bermuda triangle in the Balance of Payments. Is it difficult to know what is going on. It could be due to coverage with the Bermudan authorities simply choosing to ignore these flows on the basis that the services receipts would be fully offset by income outflows. The only significant income flow in the table above is receipts of Employee Compensation. Resident: The concept of residency is very important in the BOP because the BOP is in fact a statement of transactions between residents and non-residents. A unit must have a centre of predominant economic interest within an economic territory for at least one year or more to be considered resident of that territory. It could be that the entities receiving the payments from Ireland and the Netherlands are not considered residents of Bermuda. The infamous double-irish scheme devised to avail of the ‘same-country exemption’ in US tax law is based on two Irish-incorporated companies – one which is resident in Ireland and one which is not. A key feature is that the second company is deemed non-resident in Ireland as the test of management and control rather than the test of incorporation is applied. Of course, there is nothing to say that territory in which management and control is exercised considers the company resident there. What matters is that the company is non-resident in Ireland and, of course, residency or otherwise doesn’t really matter in Bermuda as the rate of corporate income tax is nil. It is likely the case that the payments are being made to entities that are essentially ‘stateless’. Thus we have a situation where companies are reporting outgoing payments in Ireland and the Netherlands to Bermuda but are not having the equivalent inbound payments recorded in Bermuda. And these are all likely to be intra-group transactions. Today’s International Investment Position and External Debt release from the CSO shows that Ireland’s net external debt (excluding the impact of the IFSC) has fallen to just €23 billion from €180 billion at the start of 2012. This would be a remarkable improvement if it was true but as with lots of aggregate statistics on the Irish economy it is true, sort of. The first issue that needs a second glance is our gross external debt. This actually rose €60 billion in the year to Q2 2015 before falling back slightly in Q3. Here is the sectoral breakdown of our gross external debt (again excluding the impact of the IFSC as all the charts here will). Some components of our gross external debt are coming down in particular through the monetary authority (central bank) and, to a lesser exent, monetary financial institutions. Both of these are functions of the deleveraging of the domestic banking system. The sector going in the other direction is direct investment debt, the vast majority of which is likely originating from multinationals – both MNCs which have subsidiaries here and MNCs which have re-domiciled here. This FDI effect is equally seen if we look at external assets in debt instruments with those associated with direct investment increasing very rapidly over the past two and half years. If we subtract the external assets in debt instruments from the gross external debt we can get the net external debt to see to contribution of each sector to the aggregate totals in the first chart above. This shows that three of the five sectors have net external debt positions of around zero. The central bank has rapidly moved there while the banks and other sectors (financial intermediaries, pension funds etc.) have moved into small creditor positions (they are owed more debt from the rest of the world than they owe). The two diverging sectors are the government sector (which borrowed hugely from abroad between 2009 and 2012) and the debt associated with direct investment. We can see that there are far more external assets in debt instruments than there are gross external debt liabilities linked to direct investment. This means companies here are owed much more from abroad than they owe externally themselves. Again this is likely to be an MNC effect. The impact of this is that our gross external debt is likely to be overstated (because many of the debt liabilities owed from Ireland originate from MNCs) and our net external debt is likely to be understated (because there is an even greater amount of external debt owed to MNC subsidiaries or headquarters in Ireland). This probably better reflects our position. There still is improvement with both the gross and net external debt figures falling over the past four years. Excluding direct investment (and the IFSC, of course) Ireland’s net external debt is €101 billion – with by far the largest contributor (only?) to that being the government sector. Yes, this is a higher figure than the €23 billion figure we started with above but it probably isn’t too bad all things considering. As a percentage of GDP it comes in at under 50 per cent – not exactly a headline grabbing number. And if we look at the broader net international investment position of all financial assets we can see where this improvement has gotten us (with a negative figure indicating a net liability position). It won’t be long before the explanation will be that a positive figure indicates a net asset position. In fact, if we look at the sectoral positions we can see the components of the overall net position. So if our pension funds (a large part of financial intermediaries) can earn more on their investments abroad than the government pays out in external interest costs we may even be able to turn a bob or bob from all this. 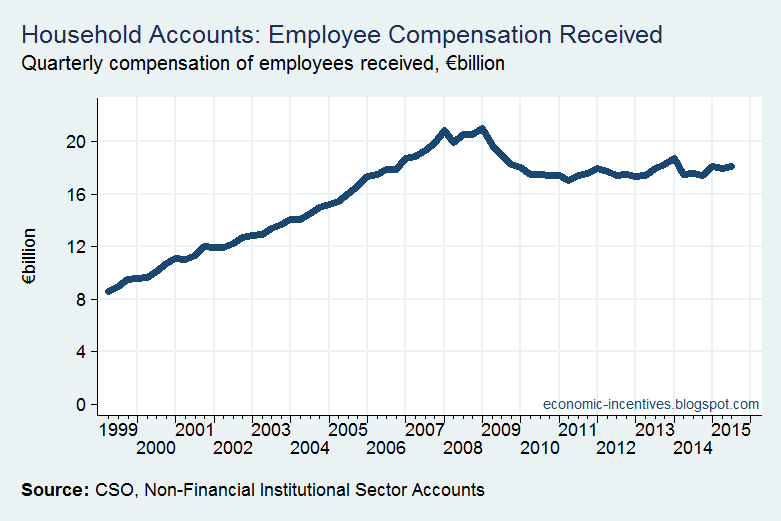 Why isn’t Compensation of Employees increasing in the National Accounts? 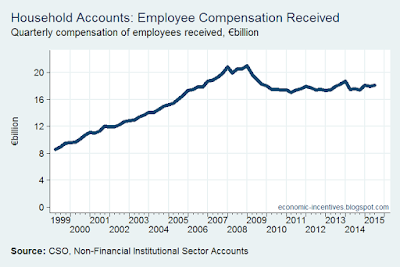 One of the notable features of the national accounts in recent quarters has been the continued stagnation of compensation of employees. 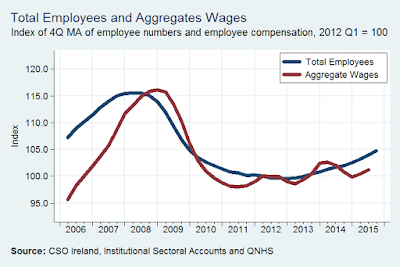 Compensation of employees reached a peak of €21 billion per quarter at the end of 2008 but since the start of 2010 it has hovered within a few hundred million of €17.7 billion, apart from Q4 2013 when it was €18.7 billion from which it quickly fell away. The most recent data is for Q2 2015 when it was €18.1 billion. 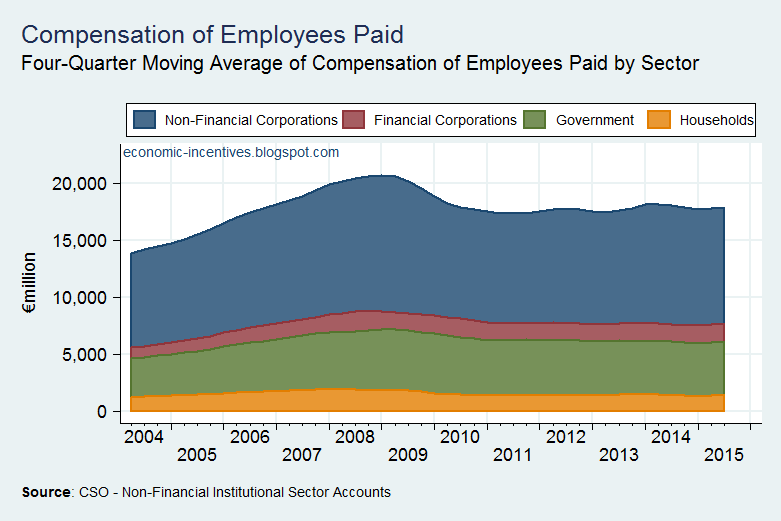 The pattern of compensation of employees seems to run counter to other indicators in the economy. From the QNHS we know that employment is growing, the ELC shows that average weekly earnings are rising and the Exchequer Returns show rising receipts from Income Tax. 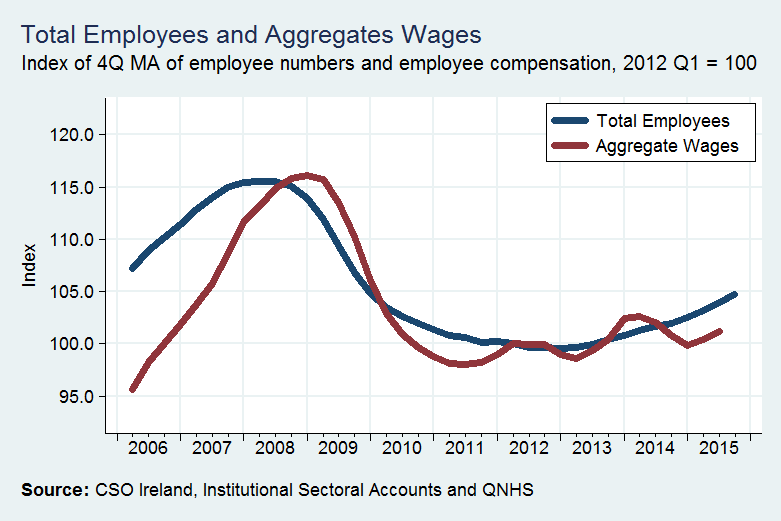 The following chart shows indices of total employment and compensation of employees with both set to 100 when employment bottomed out in early 2012. To smooth out some of the volatility four-quarter moving averages are used. The divergence during 2014 is evident. 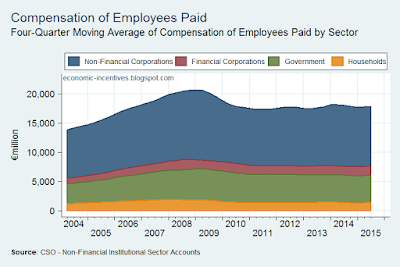 The final chart shows the source sectors for compensation of employees which, in line with the fist chart above, shows very little happening in recent years. The release of the Q3 2015 update of the Central Bank’s arrears statistics garnered some attention for the continued reduction in the overall level of arrears. The release also contains information on legal proceedings issued and concluded by lenders. First we see that the number of legal proceedings issued declined in 2015. The series jumped hugely after the lacuna in the law introduced by the Land and Conveyancing Law Reform Act 2009 was corrected by the Land and Conveyancing Law Reform Act 2013. We can see the peak of over 3,000 legal proceedings issued per quarter was reached in the first half of 2014 while the figure for the most recent quarter is around 50 per cent of the peak. 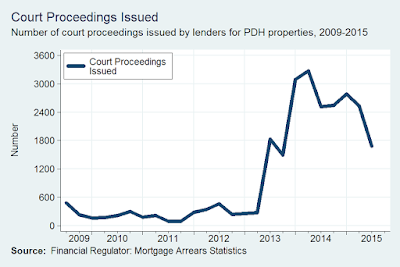 Almost 22,000 legal proceedings for PDH properties have been issued since the middle of 2013. Perhaps surprisingly, there has also been a slowdown in the number of court proceedings concluded. The number of court orders granted for PDHs in the first three quarters of 2015 was 1,314. Since the start of 2014, just over 5,000 legal proceedings have concluded and 2,300 (45 per cent) have concluded with a court order. This tallies with observations of the proceedings in the Cork Circuit Court that more legal proceedings conclude by other means (mainly strike outs) than conclude with the granting of a possession order. The outcome that is likely to be of most interest is the actual number of repossessions and this has increased significantly in 2015. So far in 2015 there have been 564 court-ordered repossessions of PDHs carried out on behalf of lenders. That is around 14 a week. 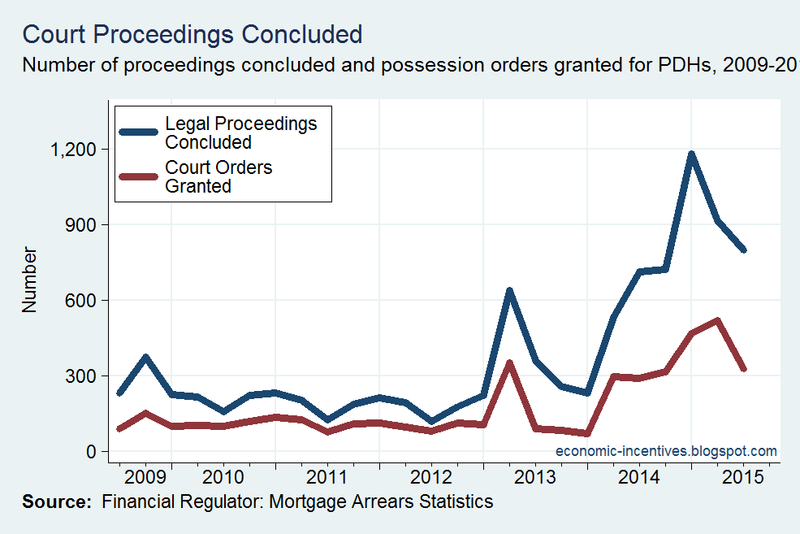 The figures suggest that around 40 per cent of possession orders are executed to give a court-ordered repossession. It would be useful to know how many of these were vacant at the time the order was granted or were let out even though the original loan was for a PDH. There are also occasions when lenders do not have to rely on a court order or executing a court order to take possession of a property. 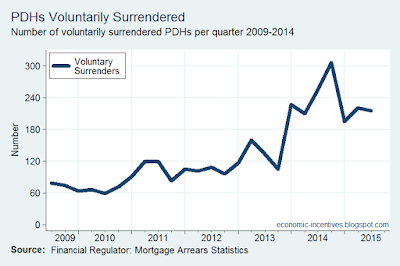 While the number of court-ordered repossessions has increased in 2015 the number of voluntary surrenders has declined slightly. 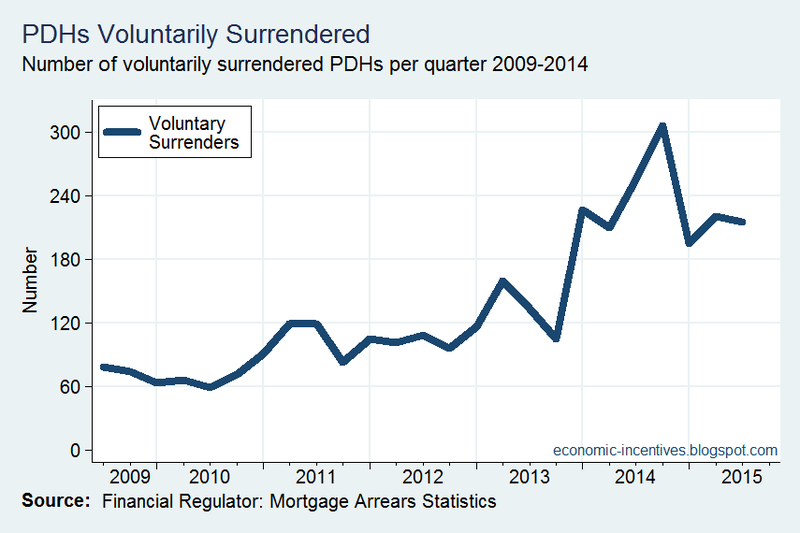 In the first three quarters of 2014 there were 692 voluntary surrenders and this fell to 631 in 2015. The statistics do not give the number of forced sales that occur though collecting data on “assisted voluntary sales” should be possible. What does the Balance of Payments tell us about the increased Corporation Tax revenues? While a lot of attention will undoubtedly be on the GDP and GNP figures in the Quarterly National Accounts release from the CSO the real action is probably in the Balance of Payments and this is also where we might find some impact of the €3 billion of extra Corporation Tax that looks set to be collected this year. The balance on the current account seems to suggest that things are little different in 2015 to the past couple of years – a sizable current account surplus. We have run a current account surplus of €6.8 billion so far in 2015 compared to a surplus of €4.4 billion in 2014. Be wary before thinking that this is ours though! Even though the balance may be little changed if we look at the components of the current account we can that there is a lot going on. The balance of merchandise (visibles) has nearly doubled since the end of 2013 while the balance of services (invisibles) and the balance of income (mainly primary) have moved in the opposite direction. Of course, anyone looking for the surge in the merchandise balance won’t be able to see it in the separate External Trade figures published each month which track visibles that physically leave Ireland. Here are the balances from the External Trade data and the merchandise data in the Balance of Payments since the start of 2012. The reason for the divergence is down to ‘contract manufacturing’ which results in goods exports appearing in Ireland’s Balance of Payments and National Accounts data even though they are not in the External Trade data. There are offsetting outbound flows to these exports. In particular, outbound royalty payments which appear under services in the current account of the balance of payments. These payments were running at around €8 billion a quarter up to the end of 2013 but are now averaging around €15 billion a quarter - €60 billion a year! These increased outbound payments are part of the reason the balance of payments is showing a services trade deficit after briefly moving into surplus in 2013. It has been explained that the growth effect of these flows is not significant as the inbound merchandise flows are offset by outbound royalty flows. However, outbound royalty payments aren’t the only thing behind the services deficit in the Balance of Payments. Just take a look at R&D imports in 2015. Ireland’s imports of R&D were already oversized in European terms when they were €5 billion a year – they’re now heading for €5 billion a quarter. There are a number of things that could be driving these increases. The first are increased payments under R&D cost-sharing agreements to pay for new product and intellectual property development; the second is the outright purchase of patents and intellectual property by Irish-resident companies. Whatever is going on it really took off in the second and third quarters of 2015. And if these are once-off outright purchases rather than on-going expenditures then they will have an impact as they wash out of the figures. So we have increased inflows under merchandise and increased outflows under royalty and R&D services but in aggregate terms one is not enough to offset the other. In the first three quarters of 2013 and 2014 the net balance of merchandise and services combined was around +€27 billion; for the first three quarters of 2015 the balance is +€34 billion. Someone is selling more than they are buying. Maybe we can see this if we look at the profits earned by FDI in Ireland. There is an upswing in 2015 but not hugely so. For the first three quarters of 2014 the profits of direct equity investment in Ireland were €28 billion. In the first three quarters of 2015 they were just short of €33 billion. An increase, yes, but not one that explains an extra €3 billion of Corporation Tax. In his recent letter to the Minister for Finance outlining the sources of the extra €2.2 billion received to the end of October, the chairman of the Revenue Commissioners showed that most of the increased Corporation Tax relates to the 2015 accounting period. This table is taken from the letter. It shows that Corporation Tax receipts for the current accounting period in 2015 were €3.9 billion compared to €2.5 billion for the equivalent current accounting period in 2014. An extra €1.4 billion of Corporation Tax could be expected to correspond to around €12 billion of extra profits. The balance of payments data show less than €5 billion of extra profits on FDI so we’re not even have way there. Niall Cody also said that €300 million of the surplus Corporation Tax receipts were a one off so that is probably related to capital gains rather than trading profits so that gets us a another bit of the way there. Of course, Irish companies may also be making higher profits so maybe we not as far off explaining the higher Corporation Tax receipts as the Balance of Payments figures might suggest. I will presenting and discussing the findings this afternoon (03/12/15) in UCC with this table probably providing the broadest summary. However it is now expected that there will be some shortfall in overall tax revenues reflecting developments in some taxes such as stamp duty. While this will be somewhat compensated for by positive developments on other elements of the Exchequer account, an Exchequer deficit of up to €1 billion now seems likely. Deputy Kieran O’Donnell: Can I go back to the last budget you put through, which was the 2008 budget, which you would have put through in December 2007? Do you believe in line with the fact that, we’ll say, stamp duty from property tax was … had gone down in ‘07 by 20% and it collapsed heavily in ‘08 went down by nearly over 50%, should you have adopted a less expansionary budget for 2008 where you increased current expenditure by nearly 9%? Mr Brian Cowen: Yes, I think I probably should have been less expansionary in that budget. It was the first year after an election and certainly there was … we did budget in lower housing output and all the rest of it. But looking back now I’d be, rather than defensive about it, I think I’d rather have done … spent a bit less then. But it was a new Government and issues arose there, but I accept that … it’s not the one I’m proudest of. Deputy Kieran O’Donnell: What would you have done differently with it, if you had the chance? Mr Brian Cowen: Spent a bit less. Deputy Kieran O’Donnell: In what areas? Mr Brian Cowen: Well, I mean, you’re asking me to redraw the budget now. I’m saying to you, you know, genuinely speaking, that looking back on it, I think the ‘08 budget, whilst it did account for the change in the situation and all the rest of it, I think probably there needed to be a … we needed to start a tighter position that year rather than allowing for the new Government to settle in, etc. Sometimes that can happen. Budget 2016 was framed around a different turning point. One where tax revenues are far exceeding, rather than falling short, of expectations. It is very unlikely that Budget 2016 will lead to anything like the regrets expressed about Budget 2008 but hopefully we have learned to not leave it until after the next turning point to act. The point of a counter-cyclical policy is to be ahead of the curve. At the end of December 2014 the retained earnings on Pfizer’s balance sheet was $72.2 billion. Irish GNP is going to look pretty impressive whenever this inversion is completed as much of this will probably be counted as Irish income. And on an on-going basis Pfizer’s retained profits will count as an income inflow in the Balance of Payments and be added to Irish GNP. For the last few years Pfizer has paid total dividends on it stock of around $6.5 billion. Net income for the past three years has been $14.6 billion, $22.0 billion and $9.1 billion. Thus the retained earnings have been $8.1 billion, $16.5 billion and $2.6 billion. These are now included in the $72.2 billion currently on the balance sheet but it can be seen that the annual amounts can be very significant and - volatile. Interpreting Irish GNP figures may become even more meaningless. What won’t be meaningless is the additional EU contributions that we may to make on the basis our of our reported National Income. Is it time for an Irish rebate in the mould of the British rebate? A less significant impact of the Pfizer inversion will be on the calculation of effective Corporation Tax rates in Ireland. This is because dividends from Pfizer’s subsidiaries will be added as ‘Foreign Income’ in the determination of taxable income in Ireland. However, Pfizer will get credits under ‘Double Taxation Relief’ for corporate income taxes paid elsewhere so the amount of net Corporation Tax due will not increase to the extent that Taxable Income will increase. Pfizer reported international revenue last year of $28.5 billion and a group profit margin of 18.4 per cent. On that basis, its international profits were about $5.3 billion, translating to a tax bill of €620 million at the Irish corporation tax rate at the current euro/dollar exchange rate if it was all taxed here. Yes, $28.5 billion multiplied by .184 is $5.24 billion and that multiplied by .125 is $0.65 billion which at the current €/$ exchange rate of 1.06 corresponds to €618 million. Flawless arithmetic. The problems with this are many. Let’s go through the numbers using Pfizer’s most recent 10k SEC filing. The $28.5 billion revenue figure is Pfizer’s non-US biopharmaceutical revenue. Pfizer’s total non-US revenue was $30.5 billion so it would seem this is the appropriate revenue to use. But why would the distinction between US and non-US revenue be important for determining Irish Corporation Tax. So what if $30.5 billion of Pfizer’s $49.6 billion is earned outside the US. What makes the $19.1 billion of US revenue earned by Pfizer irrelevant when Pfizer becomes an Irish company? Next up is the profit margin used of 18.4%. Firstly, this is the group profit margin so there is no way of knowing whether this applies to the $28.5 billion of revenue used in the calculation. Next is the problem that it is the post-tax profit margin. The objective seems to be to calculate some form of taxable income so it should be the margin before existing taxes are subtracted. Pfizer’s 10K form shows that this was 24.7% for the group in 2014. So maybe we should be multiplying €49.6 billion by .247 which gives us $12.24 billion. The next step in the arithmetic was to multiply the taxable income figure by the Irish 12.5% tax rate to get the tax due. Using the $12.24 billion we have a figure $1.53 billion. Wouldn’t $1.5 billion of extra tax have made for an even better headline? Of course, it is a nonsense calculation. The easiest problem to see is that Pfizer already has operations in Ireland so is already paying our 12.5% Corporation Tax on a share of its profits. Just because they move the headquarters here doesn’t mean we can tax them twice on their Irish profits! In Ireland, it will pay our 12.5 per cent tax rate on any international income routed through the new Dublin operation. It is true that Ireland levies the 12.5% rate on dividends received by Irish-resident companies from their trading subsidiaries in EU and treaty countries [It is 25% for non-treaty countries]. So when Pfizer becomes Irish-headquartered the dividends the parent receives from subsidiaries will be taxed at the 12.5% rate. The precise benefit will depend on how much international revenue is channelled through the merged Irish business. Pfizer may choose to pay tax locally in countries with even lower tax rates. This seems to suggest the tax paid in Ireland would be lower if Pfizer pays lower taxes in other countries. The opposite is the case. The less tax Pfizer pays in other countries the more tax will be payable here. What countries does Pfizer operate in? Most of Pfizer’s R&D takes place in the U.S. Pfizer has major manufacturing facilities in Belgium, China, Germany, Ireland, Italy, Japan, Puerto Rico, Singapore and the U.S and operates multiple distribution facilities around the world. It is likely that the tax paid in many of these countries will exceed our 12.5% rate. The exceptions are maybe Puerto Rico and Singapore where the tax paid by the these subsidiaries might result in additional tax being due in Ireland to bring the tax on these profits up to an effective 12.5%. However, Pfizer will be able to avail of “dividend pooling” so that the tax credits on all the foreign dividends received can be combined before they are offset against the Corporation Tax due in Ireland. Even after the inversion Pfizer will earn a substantial portion of its profits in the U.S. This will now be counted as a dividend from a subsidiary for the Irish HQ. It is likely that Pfizer will get sufficient tax credits from its US tax to offset any additional tax liability from Ireland it might face. And then there will be the credits from corporate income tax paid in Belgium, Germany, Japan and other countries. It is very difficult to see how the inversion alone will result in Pfizer paying any additional Corporation Tax in Ireland even though dividends from its subsidiaries around the world will become liable to our 12.5% Corporation Tax rate. The appropriate calculation is foreign dividends received multiplied by 0.125 minus double taxation relief equals nil. But where would be the headline in that? Pfizer have said that they expect their effective tax rate to go to around 17 per cent once the inversion has washed through. If a large part of the company’s profits were going to be taxed in Ireland wouldn’t this be closer to our 12.5% headline rate? Now, it is possible that Pfizer will pay more Corporation Tax in Ireland. We simply do not know the full detail of what its new tax structure will look like. Pfizer likely has a major tax restructuring that it wishes to implement of which the inversion is just one part. But to suggest that Pfizer will be paying our 12.5% tax on its net non-US profits is misleading in the extreme. So why is Pfizer engineering this inversion? The reason is in this table from its 10k filing. The reason is the deferred U.S. corporate income tax which was $725 million in 2014. The table also shows that Pfizer pays lots of ‘international’ income taxes ($2,321 million in 2014) which doesn’t seem to leave much for our double-dip to bring them up to 12.5%. The problem for Pfizer is that the US’s worldwide regime is applied at 35%. The table also shows that a large part of Pfizer’s tax provision is not actually paid – it is deferred. The inversion will not really change the income tax Pfizer pays but it will change the corporate income tax it owes. The cash tax paid of $2,100 million in 2014 (and $2,874 million for 2013) can be compared to the tax provisions in the above table. As of December 31, 2014, we have not made a U.S. tax provision on approximately $74.0 billion of unremitted earnings of our international subsidiaries. As these earnings are intended to be indefinitely reinvested overseas, the determination of a hypothetical unrecognized deferred tax liability as of December 31, 2014, is not practicable. This is the issue the inversion is trying to address. Pfizer wants greater flexibility to utilise its profits without running the risk of tripping a major US tax payment on profits which are earned outside the US. It looks like Pfizer has found a dance partner and that the inversion with Allergan is set to go through. So who is set to gain from this? The big advantage for Pfizer is that it is no longer subject to the US corporate income tax of 35 per cent on its worldwide profits. The US is unusual in that it requires US companies to pay US corporate income tax on their global profits and not just those profits earned in the US. As the US has the highest corporate income tax rate in the OECD this means that US companies will have to pay additional tax to the US government to bring the overall tax paid on their profits up to the US 35% rate. Of course, as lots of companies can engineer a deferral of this tax payment until the profit is formally repatriated to the US, many US companies choose to keep profits "offshore" rather than repatriate them and pay the additional tax due. This hinders what the company can do with the profits such as transferring to the parent to invest in R&D or to distribute to shareholders. Ireland is also in the bracket of unusual countries in that we too have a worldwide regime - but in this instance at one of the lowest corporate income tax rates in the OECD. This means that Irish companies have to pay very little additional tax on their non-Irish profits as they will already have paid sufficient tax in the countries they earn the profit to bring them up to (and over) the 12.5% rate. By becoming headquartered in Ireland this is the position Pfizer hopes to move to. They will continue pay tax at the appropriate rates in the countries they operate it, but now won't have to pay additional tax when they aggregate the profit in the company’s HQ unlike they would have to do if the HQ remained in the US. This won't change hugely the amount of tax that Pfizer pays – though it will change the amount of tax that it owes. Up to now Pfizer has owed US corporate income tax on its non-US profits but can defer the actual payment of most of it using various provisions in the US tax code. But it is by doing this that Pfizer faces restrictions on what it can do with its profits. The inversion will have no impact on most of the countries Pfizer operates in (UK, Germany, France etc.) and the company will continue to pay corporate income tax on the profits it earns in those countries at the rates those countries levy. The move will also have little impact on the amount of Corporation Tax the company will pay in Ireland. By becoming Irish-headquartered all of Pfizer's global profits will become subject to Ireland's Corporation Tax and not just the profits it earns from its existing activities here. However, as the tax paid in the countries where these profits are earned is likely to exceed our 12.5% rate the amount of additional tax that will be due in Ireland will be nil. There are almost no benefits to Ireland from these inversions. There are likely to be further distortions to our national accounts and if the switch to becoming Irish-headquartered causes Irish GNP to be higher we could potentially face a higher bill for our contribution to the EU. So if anything it could cost us. The benefits are for the company that escapes the clutches of the US 35% corporate income tax rate on its profits earned outside the US though Pfizer will continue to be subject to the US 35% rate on the profit it earns in the US. Of course, once the structure is in place this will impact on future decisions of the company so the amount to be taxable in various jurisdictions may be different to what it would be had the inversion not taken place. According to figures released by Revenue, the total income of those liable for income tax was €77 billion in 2011. By their calculations, this is expected to rise to €98 billion in 2016. This €21 billion in new income represents an increase of more than a quarter in just five years. This includes 355,000 new tax cases (either couple or individuals), a rise of 17% from just over two million to 2.4 million (see appendix of this paper for all calculations). The most startling thing about these figures is how unequal the gains have been. Of the €21 billion in extra cash, about €12 billion, more than half, has gone to the top 10% of earners. Two thirds of it - €14 billion - has gone to people who earn more than €70,000, despite the fact that they make up less than 15% of Revenue’s income tax cases. On the other hand, less than a third (€6.5 billion) has gone to the middle 60% of earners, with only 6% of all the increase going to the bottom 50%. This represents a fundamental shift in how the market distributes income. From 2011 to 2016 the share of income going to middle income earners fell from 52% to 46% which is a loss of more than 10% of the share of all income. At the same time, the Top 1% went from having 9% of all income to having 11% of all income – a gain of more than 20%. Given that there is an expected €21 billion increase in Gross Income from 2011 to 2016 one wonders whether the definition of Gross Income has changed? Will Gross Income really have increased by 27 per cent over this five year period? If true it is a remarkable performance. However, if “more than half, has gone to the top 10% of earners” then that would knock a lot of the lustre off it. But the report itself points to a couple of points which indicate that the distribution of the increase may not be as skewed as the headline-grabbing points suggest. The first is that there are 355,000 new tax cases. By definition these have to have received additional income. However, we don’t know where they have entered the distribution so it’s hard to draw out how much of the additional income has gone to new earners and how much has gone to existing earners. If new earners enter towards the top of the distribution is this a bad thing? Because of the nature of the Revenue data, the groups are approximate. In 2011 the bottom 50% was 49% of all tax cases, the Middle 60% was 58%, the Top 10% was 9.8% and the Top 1% was 0.91%. In 2016 the bottom 50% was 46.3% of tax cases, the middle 60% was 56.4%, the Top 10% was 11.8% and the Top 1% was 1.2%. This will account for some variation in the data. You can be sure it will “account for some variation in the data”! Comparing the top 9.8 per cent in 2011 to the top 11.8 per cent in 2016 is misleading. Of course this group has extra income – you just put an extra 20 per cent of tax cases into it! Here are the details of tax cases with Gross Incomes over €75,000 in the two years. The changes are pretty clear. What is noteworthy is that for a group that apparently got more than half of the €21 billion of additional income is the what happened to the average income of the group. Yes, averages have their problems and there are lots of moving parts here but the average increased by 2.5 per cent whereas the total income in the group increased by over 45 per cent. This suggests that most of the increase in the income of this group is down to the increase in the number of people in the group rather than increased income for the people who were in the group to begin with. If the comparison was a like-for-like comparison so that 9.7 per cent of tax cases were analysed in each year then there would be 234,440 in the 2016 group rather than the 283,674 that were actually in the group. This means that 49,234 tax cases were added to the “Top 10%” because it actually went from the “Top 9.7%” to the “Top 11.8%”. If these 49,234 extra tax cases put into the group had a Gross Income of €75,000 (the lowest possible) then this means there is a minimum of €3.7 billion of extra income in the “Top 10%” that is only there because of the increased size of this group. That is 31 per cent of the additional income attributed to this group. A headline that the “top earners main winners in recovery” is clearly what the analysis was designed to engineer. But it is not true. The main winners are the recovery are the 355,000 new tax cases since 2011. From the data available is it impossible to say where these new tax cases have entered the distribution. This would paint a much different picture than doing arithmetic acrobatics with the distribution. For example, every €10,000 of Gross Income that these new tax cases have is €3.5 billion of Gross Income. How much of the €21 billion of Gross Income is the result of these new tax cases? If they’re at an average of €30,000 that is €10.5 billion. That is half the increase in Gross Income from 2011 to 2016. It is unequal but it is desirably unequal. There has been an increase in inequality between the two years However without testing for the significance of this difference or knowing what happened in the intervening years we cannot be too conclusive about the pattern. It is also likely that the distribution of market income across the population is more equally distributed as there are 355,000 new tax cases in 2016 compared to 2011. The share of our income that goes on Government services such as welfare, health and education is very low by European standards. Surprising because here is the conclusion I came to when looking at public spending on health, education and social welfare excluding old age social protection. Using a hybrid measure of national income for Ireland (between GDP and GNP) Ireland is the fourth highest spender in the EU on health, education and welfare excluding old age social protection. It is not what we spend that matters (we spend plenty) it is how we spend that matters. We can do lots of acrobatics to see why Ireland is below average in the EU when it comes to public spending but one reason stands above all others: spending on old-age social protection. In most countries this is the largest single area of government spending. There are two reasons why Ireland is at the bottom in this category: firstly, as a proportion of the population, we have fewer older people than every other country in the EU, and, secondly our public pension benefits are flat-rated. The mean expenditure on old-age social protection for the other 27 countries in the EU is 9.4 per cent of GDP. That is more than double the Irish level. If Ireland was at this level in 2013 it would have meant spending an extra €9.5 billion on old age social protection. To reach the level of spending of the countries at the top (14 per cent of GDP ) would require spending almost €18 billion more. If other countries have better public services than us (what evidence is there that they do?) it can’t be because they devote more of their national income to them than we do. Other countries do have far more comprehensive systems of public pensions than we do but in those systems those who make the most contributions receive the most benefits. Below are some tables that look at the breakdown of spending in health, education and social welfare. No national income adjustment is made so all the data is by GDP. No commentary is provided. Click to enlarge. For health and education we have a alternative breakdown by type of spending rather than area. Again click to enlarge. We are looking for someone to run our advertising services outside of the Americas. What you have to do is provide the logistics and administration and deal with the customers; we will provide the technology from our engineers in the US. Based on the most recent year we estimate that revenues will be about €18.3 billion. Of this around €5 billion will go to various websites and organisations who host advertising on their websites. You will also have to work with customers in the countries to ensure the services provided match their requirements. It will cost you around €300 million to have these offices around the world. We want to have the logistics, billing and administration and other functions organised on a centralised basis. This will probably require around 3,000 staff and significant investment in buildings and facilities. This will probably cost around €300 million a year. This gives a cost of sales of €5.6 billion and an operating profit of €12.7 billion. Obviously we’re not just going to let you keep €12.7 billion which is almost wholly earned from the technology we have created but we’ll split it with you. We’ll charge you a fee that is equal to 98.5 per cent of the operating profit. Based on the figures about you will pay us €12.5 billion and you will be left with a profit of €200 million. If you keep that in a company you will probably pay around €25 million in Corporation Tax to the Irish government. And for every extra €100 million in profit you generate you get to keep €1.5 million so we think the incentives are pretty balanced. So what do you say: are you willing to be the servicer of Google’s advertising products outside the Americas in return for 1.5 per cent of the operating profit? If this was offered it should surely be a question of where do I sign up. The technology is a market leader. OK, running an operation in Dublin with 3,000 people and dealing with offices and customers around the world will be pretty demanding but I will gladly take €200 million of compensation for doing something pretty demanding. Anyone indicating displeasure at the amount of Corporation Tax Google pay in Ireland can only do so if they would refuse the above offer. Who in their right mind would refuse the rights to Google’s advertising technology even if they have to pay over 98.5 per cent of the operating profit? The issue with Google is not the €12.5 billion license fee that is paid out of Ireland. The issue is where it goes. The technology was developed in the US and the key decision makers for the technology are in the US yet the payment ends up in Bermuda. The issue is that the payment ends up somewhere where the company has no substance. That is what needs to be addressed. We don’t need faux outrage from people who would all accept the above offer. the property has been sold or voluntarily surrendered and the legal proceedings are unnecessary. The most frequent outcome when cases come before the County Registrar is for them to be adjourned. 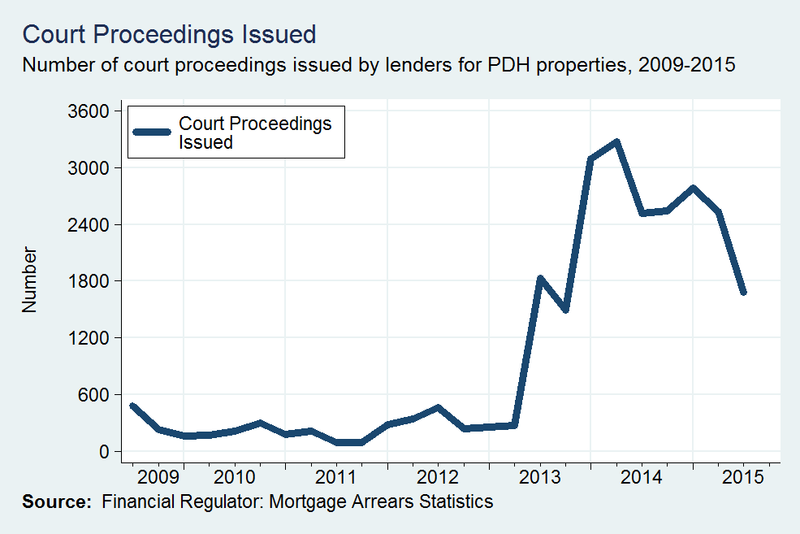 In October, 98 cases were adjourned as per the practice direction of the President of the Circuit Court which requires that possession cases involving mortgages be adjourned on their first date before the court. Even more cases were adjourned by the lenders themselves with 141 cases adjourned by the applicant banks. There are many reasons for this. Some are for legal reasons such as to change the name on the civil bill because the loan has been sold but most are because there is on-going engagement with the borrowers. The banks can seek time to assess a recently submitted SFS or they can seek time to see if the borrower can adhere to a revised repayment amount for a test period. Some cases are adjourned generally with no new date given but the applicant has “liberty to re-enter” if circumstances change, such as the borrower not adhering to an long-term repayment arrangement. There were 48 cases listed which could not proceed because notice of the case had not been served on the borrower. This seems to be a combination of borrowers who cannot be found (thus substitute service such as ordinary post or pinning the notice to the property is required) and instances where the lender has issued a civil bill but not formally served notice on the borrower (possibly because some engagement is now taking place). Cases where service cannot be effected will likely conclude with a possession order being granted (with many of these properties likely to be vacant) while cases were service has been delayed will hopefully be struck out at a future return date (if the borrower can resume payments to the satisfaction of the lender). There were 27 cases where the lenders proceeded with their application for a possession order. They were granted two possession orders, of which one was by consent. In the 25 other cases where the lenders sought an order the case was adjourned against their wished. About half of these were back to future hearings of the County Registrar with the other half sent for hearing before a judge of the Circuit Court. All the 91 cases that were on the list for the 28th of October are cases that had previously been heard before the County Registrar. Of these, 18 had been adjourned by the County Registrar in previous sittings where the lenders had sought to proceed with their application for a possession order. When these cases came around again in October the lenders sought to proceed in just five of the cases while the other 13 were adjourned by the lenders as engagement, of some level, was now taking place. One case where the lender had previously sought an order for possession was adjourned generally by the lender with liberty to re-enter. Of the five cases where the lender proceeded again with their application for possession four were adjourned by the County Registrar and in three of these this was the third time this year this happened. In one of these no payment had been made since 2009 and the arrears are over €120,000. A proposal for a lump-sum payment was made at a hearing back in July but has not yet materialised. The borrower had legal representation in court who said the lump-sum would be available in May 2016. The case was adjourned to February with the Registrar requesting that some regular payments be made in the interim. One order was granted and that was by consent with the borrower present in court. For notes on this case from a hearing last July see case #10 on this list. Typically a stay of three to six months is applied to such orders but the borrower asked for a short stay as they were no longer using the property. It was set at one month. Of the total of 369 cases heard in October about 310 will appear on future lists for sittings of the County Registrar. And no doubt will accumulate fees for the legals involved. Why are we betwixt and between the fiscal rules? Ireland is set to leave the Excessive Deficit Procedure next year. This is the “corrective arm” of our fiscal rules and is based on bringing a deficit that is above three per cent of GDP back below it. The mechanics of the EDP are fairly straightforward: each year a country is set a headline deficit target with these targets reducing systematically to the three per cent of GDP level. Once a country gets below the three per cent of GDP threshold it moves to the “preventative arm” of the fiscal rules which are based on reducing any remaining structural deficit. In theory the “preventative arm” is more flexible than the “corrective arm” where rigid targets to bring the overall deficit below three per cent of GDP must be adhered to. Under the Excessive Deficit Procedure Ireland had to get the deficit below three per cent of GDP by 2015. This is a target that was set in December 2010 which is almost five years ago and it was not adjusted in the interim. Is a deficit target that was set five years ago appropriate for fiscal policy now? In rough terms we had to reduce a deficit that was around €20 billion in 2009 to €5 billion in 2015 – and we achieved that with room to spare. Ireland over-performed the EDP deficit target each year and this over-performance increased as the economy improved in the past two years or so. In 2015 all we had to do was return an overall deficit that was below 3 per cent of GDP. If there had been no changes on top of last year’s budget it is likely this year’s deficit would have been somewhere around 1.5 per cent of GDP. Hence, under the apparently more rigid “corrective arm” there was allowable space to introduce supplementary spending for 2015 and this was flagged with around €1.5 billion of supplementary spending estimates included in the White Paper last Friday. This brought the 2015 deficit back up to 2.1 per cent of GDP so still well below the three per cent of GDP target. From 2016 Ireland will have left the EDP so the fiscal landscape will be about reducing the remaining structural deficit at a particular pace and, measurement issues aside, the rules have some in-built leeway. If the economy is doing poorly (negative growth) and is below its potential no effort has to be made to reduce the structural deficit under the balanced budget rule. The fiscal effort can be delayed until the economy improves. If the economy is showing some growth and is close to its potential then some effort to reduce the deficit is required. This is where the figures published by the Department of Finance back in April put us. Of course, as 2015 has evolved the economy has continued to improve and all growth forecasts have increased and most of these are now above the potential growth rates of the economy. In rough terms the four per cent plus growth rates for 2016 that most forecasters, including the Department of Finance, are pencilling are above the long-run potential rate of the economy. The fiscal rules are designed so that countries with a deficit have to make greater effort to reduce that deficit when their economies are growing strongly. And the revised figures published by the Department of Finance this week reflect the fact that the Irish economy is growing strongly. The original figures published in April put Ireland in a place where the required reduction in the structural deficit must be greater than 0.5 per cent of GDP. However, the updated figures published this week put us in a position where the required reduction in the structural deficit must be greater than 1.0 per cent of GDP. That is, now that the economy is growing faster we should be doing more to reduce the deficit. By the letter of the fiscal rules it appears the deficit reduction required is that which corresponds to the April figures. But the Irish economy is a small, open economy that can turn around very quickly and it has. Should we ignore the spirit of the fiscal rules which requires countries with deficits to reduce them faster in times of economic growth simply because an earlier set of figures allow for a more expansionary budget? And this is the key point. The key point is not some esoteric discussion about which figures for the output gap and potential GDP growth should be plugged in to a fiscal adjustment matrix. The key point is that at a time when the economy is growing, when we can reduce the deficit without significantly harming the economy, we are choosing to introduce policies that will prolong our borrowing. This does not mean there cannot be increased spending. There can be lots of additional spending but it must be matched by equivalent revenue measures. We were led to believe that the budget would be framed around a fiscal space of €1.5 billion. In practical terms over the past week we have had over €3 billion of expansionary budget measures introduced. First there was the €1.7 billion of supplementary spending estimates for 2015 that were flagged in the White Paper published last Friday. On their own supplementary estimates are not unusual and have been a regular feature of public finance in Ireland. But the public finance practices of the past are part of the reason we got into our current predicament. As we will still be below the three per cent of GDP target for 2015 these supplemental spending increases become “baked in” and give the starting point for 2016. One danger is that these permanent increases in expenditure are based on temporary sources of revenue. And then on Tuesday we had a further €1.5 billion of tax cuts and expenditure increases added on top of that. So all told over the past week we have had expansionary measures totalling over €3 billion introduced. The fiscal rules do not prevent additional spending. They direct that discretionary expenditure increases (such as these supplementary estimates) should be matched by equivalent revenue measures or offsetting savings elsewhere. Unexpected inflows of Corporation Tax would not count as a revenue measure under the rules. This will be the position from 2016. At the moment we are crossing the threshold from the “corrective arm” to the “preventative arm” and there are gaps in the crossover, particularly for an economy that is growing strongly, that allow this increase in spending under the letter of the rules. Using these gaps for large supplemental increases in expenditure undermines the budgetary process as expenditure ceilings become meaningless if they can be increased when windfall revenues are available. Ireland would come well short of meeting the required reduction in the structural deficit if we applied the deficit rule to the 2015 outcomes. The budget documents show an improvement in the structural deficit of just 0.2 per cent of GDP is expected in 2015. This is not an issue under the letter of the rules as what is required is for the headline deficit to be below three per cent of GDP and this is easily achieved because of improvements in the economy and the surge in Corporation Tax receipts. But the spirit of the rules is that countries with deficits should do more to reduce them in times of economic growth. And, to repeat, this do not mean there cannot be increased spending. There can be lots of additional spending but it must be matched by equivalent revenue measures. Surely our recent history is proof of the benefits of that. And the rules have some additional flexibility if that spending is for capital rather than current purposes. If the structural deficit rule and the expenditure benchmark are good rules for 2016, and the budget documents make various positive references to adhering by those rules in 2016, surely then they are also good rules for 2015? Is it prudent to frame our fiscal policy based on a target set in December 2010 when the notion of six per cent growth in the Irish economy would have been derided? Fiscal rules are useful but they are imperfect. They are a guide not a crutch. We have rules of the road for driving but we don’t blindly ignore the conditions around us and drive at the speed limit at all times. There are many times we hit the brake because of road conditions even though the rules don’t require us to slow down. Irish fiscal policy for 2015 was framed based on a target set in 2010. The economic conditions are hugely different now. Of course, there are factors other than the economic cycle that drive fiscal policy but that is not our concern here. Our fiscal stance may adhere to the letter of the fiscal rules but if you think it is too expansionary for the unknown twists in the road that might lie ahead then you are probably right.